Did you know that all men's wristwatches have their roots in military watches? This site showcases many of today's best, renowned and tested military watches around. Whether you are an enthusiast, someone with a casual interest or considering to purchase a trusted military watch, this site has lots of information for you. Shaped by the history of war and developed through real battlefield experiences, military watches naturally have a background and history that are completely different from ordinary wristwatches. Military watches evolved through deep involvement in real military operations and so their developments are not manufacturer-initiated. Rather, their functional characteristics and styles all reflect deeply the leadership and involvement of military operations, tactics, personnel and needs of the times. At the World Military Watches Command, you can go straight to the well established and popular brands such as Luminox, MTM, Traser, Nite to check out information about them. You can also get a bird's-eye view on the exciting history of military watches (highly recommended!) to see how military watches came to be and how they evolved to what they are today. Be sure to check out the highly recommended and popular illustrated guide devoted specifically to military watches. Our Tips and Guides department provides lots of useful information for learning so that you'll enjoy wearing your military watch even more. We are constantly updating and adding more new information and brands. Take your time to browse around and we welcome you to visit us often. Originally designed for the U.S. Navy SEALs, Luminox watches continue to serve the demanding front line needs of special forces, government units, and your outdoor activities. LED illumination, torchlight, electromagnetic induction charging system, MTM's first-in-the-world ideas have brought the concept of military watches to a new higher level. 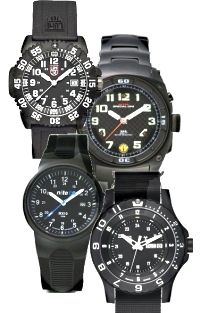 Nite made its debut in the world of military watches as <i>the</i> timepiece issued to and used by the S.A.S., one of the world's elite special forces. No frills, no gimmicks, solid, robust and MIL-Spec built. Traser is known by inner-circles as the "King" of military watches. Here's why. Ultimate proof of high precision, reliability, preformance and robustness. What is MIL-Spec and what does MIL-Spec compliant military watches mean? Find out here. No compass? No problem. Finding direction is easy if you have a watch. Highly recommended reading and popular illustrated guide devoted specifically to military watches. Would you like to share your knowledge about military watches? Great, find out how you can submit your story or tip here.